KATHMANDU: Sept 29: The benchmark Nepal Stock Exchange (Nepse) climbed modestly higher on the first trading session of the week with a gain of 2.61 points. The market remained closed on Monday, while the trading resumed with notable strength on Tuesday. 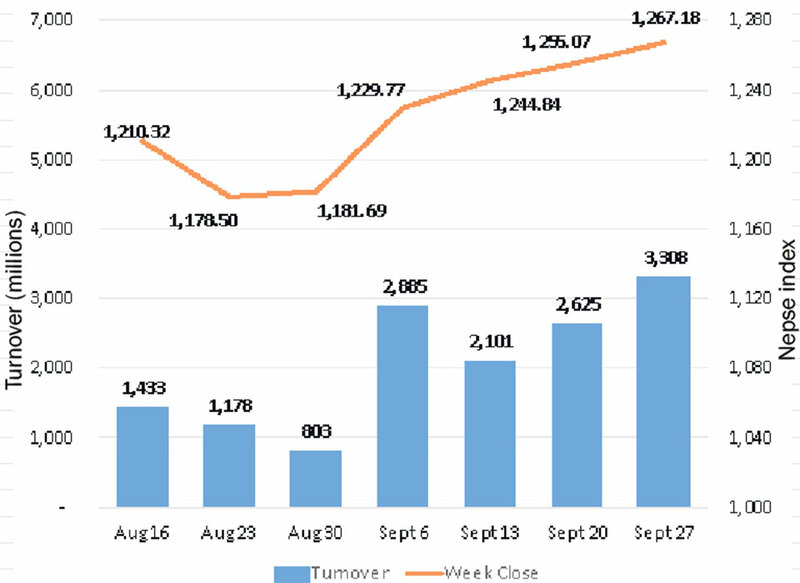 On the day, the index climbed 22.37 points to hit a fresh six month closing high of 1280.05 points. The market pared some of the gains on Wednesday and Thursday with drops of 2.31 points and 10.56 points in the respective sessions. Nonetheless, the index posted an overall weekly gain of 12.11 points or 0.96 percent to settle at 1,267.18 points. Following the weekly gain, the rally has persisted for a fifth consecutive week reflecting optimistic investor sentiments of late. The surge came on the back of buying pressure seen mainly on the market heavyweight banking stocks. The upbeat sentiment also led the weekly market activity to its highest year-to-date level. More than Rs 3.30 billion worth of shares were traded in the bourse in the review period. Sensitive Index, which measures the performance of Class 'A' stocks, outperformed the broader market with a gain of 1.18 percent. On the sectoral front, Trading stocks led the advances as its sub-index added 5.90 percent in the week. Banking scrips also showed a significant move to the upside with its sub-index closing more than 2 percent higher. Sub-Indices of Development Bank and Hotels sub-group also rose 1.89 percent and 1.76 percent, respectively. Manufacturing & Processing, Finance and Life Insurance sub-indices also edged higher. Conversely, 'Others' sub-index was the biggest drag for the week with a dip of 1.69 percent. Besides, Non-Life Insurance, Hydropower and Microfinance sub-indices also ended the week in the red. List of actives remained dominated by commercial banks' scrips. Shares of Prabhu Bank Ltd posted the highest turnover of over Rs 233.61 million followed by stocks of NIC Asia Bank Ltd with a total transaction of over Rs 178.34 million. Further, shares of NMB Bank Ltd and Nepal Bank Ltd posted turnovers of over Rs 160 million each. Kumari Bank Ltd's shares were also actively traded and posted a turnover of more than Rs 143 million. On the announcement front, Nirdhan Utthan Laghubitta Bittiya Sanstha Ltd announced a total dividend of 42.11 percent to its shareholders on Friday. The dividend includes 20 percent bonus shares and 22.11 percent cash payout. After the capitalization of the bonus shares, the micro sector lender's capital will increase to Rs 1.2 billion. ARKS technical analysis indicates the market retracing to 1,267 points after crossing 1,280 points for the first time in three months. Despite slight dip, bulls still seem to be in control with the index trending firmly above the previous short term consolidation range at around 1,250 points. Hence, the index is likely to further extend its rally, given the aforementioned zone acts as a support for the equity market.